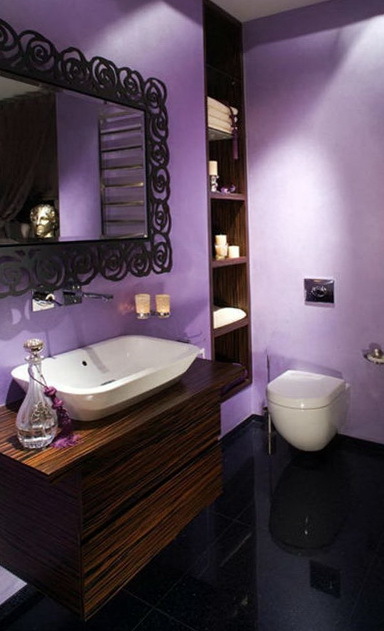 Purple bathroom – this color blends well with other shades, from the coarse black to pale beige and white. This color is good decorate the bathroom. 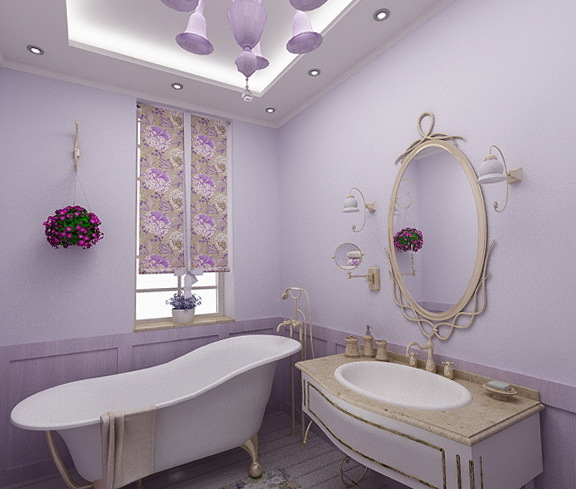 In the purple colored bathroom will look very elegant and romantic. Incidentally, the color purple combines strength and gentleness, he will sharpen vision and feelings. Purple is the color of illusion and magic because it is derived from the interactions of red and blue paint. For example in the summer of this color you will cool and warm in winter. 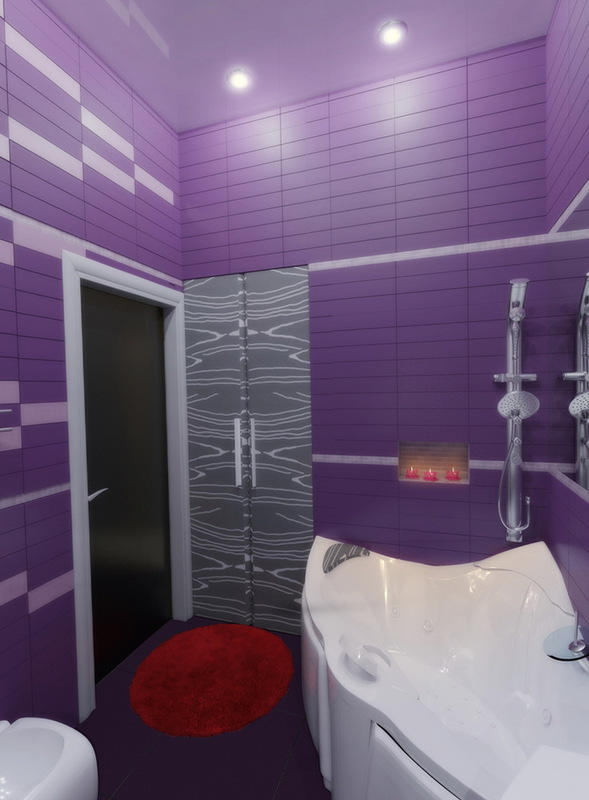 In the purple room bathroom you will be very convenient, this site will allow you to relax more this color is useful for insomnia. Therefore, you should take a shower before going to bed is in the bathroom with these shades. The bathroom in the purple color very well with the black color, such as the bathroom or in the manner of a zebra, dark base and white objects are combined and look – stylish. 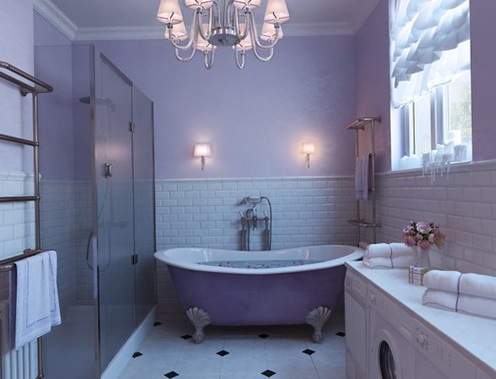 The bathroom can be elegant legs, if you cannot paint the walls in purple color, you can use lighting with violet hues, which would break the magic room. If you do not want to experiment much and you just start trying to pick a color, opt for a white bathroom – bright purple carpet. If the bathroom is long and large, you can use darker shades of purple, such as countertop by the sink and the wall in a bathroom stall. 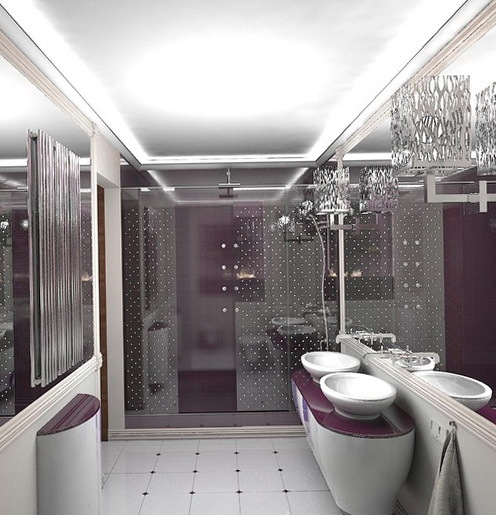 That the bathroom looks – amazing, gentle purple, goes well with white shades. In this bathroom is even a comfortable sofa where you can do a pedicure and manicure, or unwind after a bath. 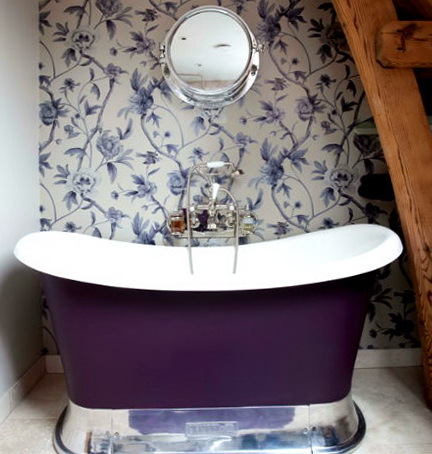 Even in a small bathroom, you can use the tiles in shades of purple, and it can look great, and the special shelf for candles will create a romantic ambience.